I posted a BYGL Alert this past Tuesday about an unidentified flea beetle attacking sedum in Ohio [see "Sedum Conundrum and Passionate Plea," June 26]. I called the beetle the "Sedum Flea Beetle" in my report. 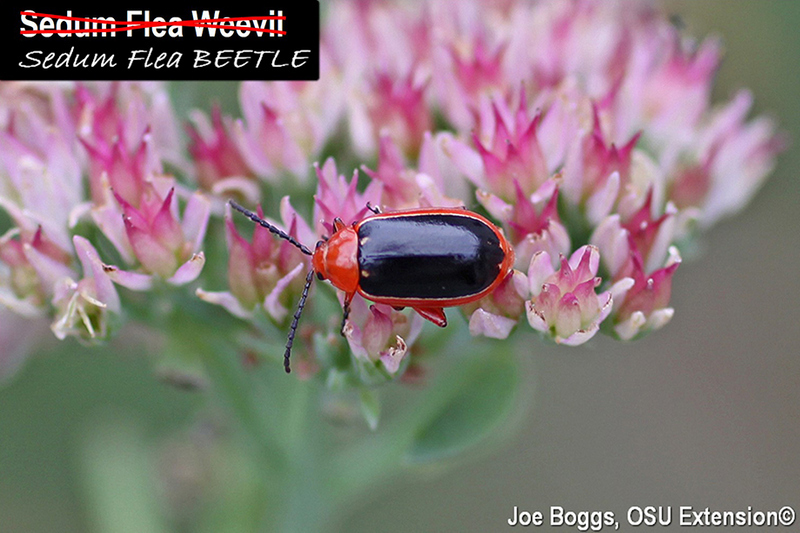 Unfortunately, I labeled every image in my report, "Sedum Flea Weevil." Weevils are beetles, but they are beetles with a snout (rostrum). I did not catch my error until today. BYGL reader Fred Robinson caught my error and sent an e-mail message on Tuesday noting the beetles did not have snouts. I thought he was referring to a mistake in my writing which was confirmed when I found one error and corrected it. My apologies to Fred and all. CORRECTIONS WERE MADE: The label on every picture in my original BYGL Alert posted on June 26 has now been professionally corrected. As you can see, I spared no expense. I'm still hoping for reports of populations of this Sedum Flea BEETLE in Ohio. If you see it, would you please contact me? Just click on my name at the top of this report to get my e-mail address. It's also a great way point out the errors of my ways.